Running Press Adult, 9780762448654, 160pp. Even if you don't have a B.A. in English, tonight you're gonna drink like you do! Tim Federle is a Broadway actor, word nerd, cocktail enthusiast, author of the YA comic novel, Better Nate Than Ever, and former lifestyle columnist for Apartment Therapy. He lives (and drinks) in New York City. Say hi at TimFederle.com and on Twitter at @TimFederle. "It's a little-known fact that the information in here will make anyone look and sound better than they actually do"
"...this is a wonderfully entertaining read, slight enough to be digested in one sitting, clever enough to be entertaining even if you never make a single one of the cocktails." 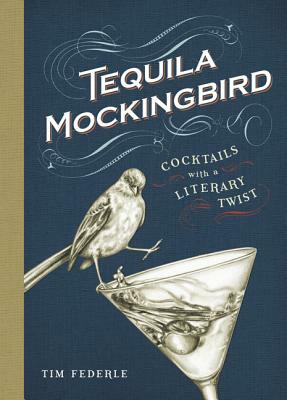 "Tequila Mockingbird is a refreshing reminder that drinking is supposed to be fun, and it brings together the kind of cocktails you'll actually make into a book you'll actually use." "You've never seen so many literary inside jokes in your whole life, which makes this little cookbook my new favorite thing... The commentary is hilarious, to boot." "Ingredient by ingredient I became a fan of the ersatz bartending guide for English majors, in which summaries of classic novels and their corresponding recipes are garnished with groan-worthy puns and sepia-toned illustrations. I toast to that!" "Pun-tastic cocktail delights . . . peruse it to find your book club's next read (and cocktail)."